HELENSBURGH’S historic war memorial in Hermitage Park will benefit from a major donation handed over on Thursday February 3 by Argyll and Bute Council thanks to the Heritage Trust. 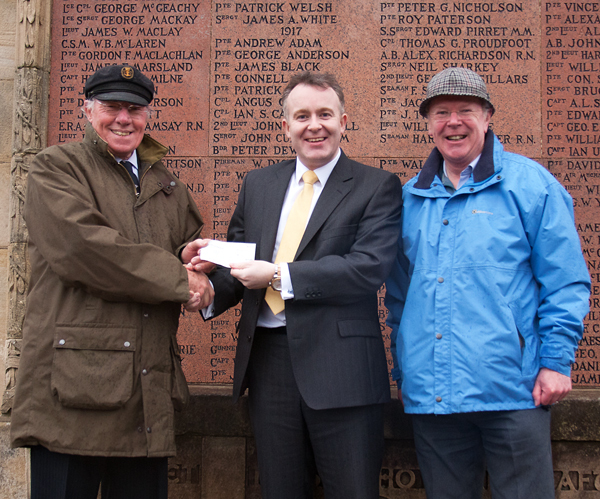 The Faslane-based marine and technology division of the Babcock International Group presented a cheque for £2,000 to help pay for much needed repairs. The cheque was handed over by Babcock business services director Seonaidh MacDonald to Councillor Al Reay, watched by Trust chairman Stewart Noble. Mr MacDonald said: “We are delighted to support this project which has such significance to the historical importance of this area. We hope that our contribution to the restoration work enables the local community to continue to appreciate this monument." It has been reckoned that perhaps one in five of the young men in Helensburgh was killed during the First World War, and a similar number were probably injured both physically and mentally to differing extents. In common with the vast majority of towns and villages throughout Scotland it was decided that a war memorial should be erected to remind local people of the horrors these young men had undergone. After the war money was raised by public subscription to build a substantial war memorial in the walled garden of Hermitage House, which had been bought by the town in 1911 to form a public park. A design competition for the war memorial was won by the well-known local architect and artist A.N.Paterson and the memorial was completed a few years later, at which point it was handed over to Helensburgh Town Council. Following various changes in the organisation of local government over the years, the war memorial now belongs to Argyll and Bute Council. Historic Scotland, who are responsible for the listing of historic buildings and structures, have given the war memorial itself, the walls of the old garden and the gates to the war memorial, a grade A listing. This gives these three structures a listing of the highest possible importance, and it is the only war memorial in Argyll and Bute to have such a high category. Stewart Noble said: “There has been increasing concern over the state of the surroundings of the war memorial in recent years, although the memorial itself is in good order. 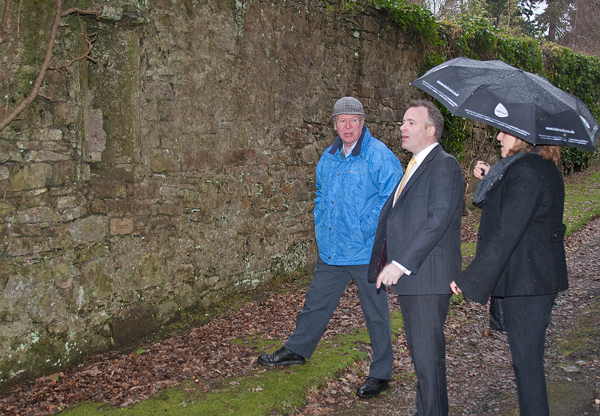 “Firstly, a substantial hole developed in the west wall, and this was only repaired in 2010. “Secondly, there has been substantial growth of ivy over the walls in many places — while this is perhaps helping to hold the walls up at the moment, ultimately it is likely to damage the walls and perhaps even cause their collapse. Two years ago Argyll and Bute Council reckoned that some £30,000 required to be spent to rectify all these problems. The state of the war memorial was raised at a Heritage Trust board meeting, and it was decided to write to Babcock at Faslane to see whether they might be prepared to make a charitable donation towards the repairs. Pictured (from left) are Councillor Al Reay, Seonaidh MacDonald and Stewart Noble. Photos by Donald Fullarton.